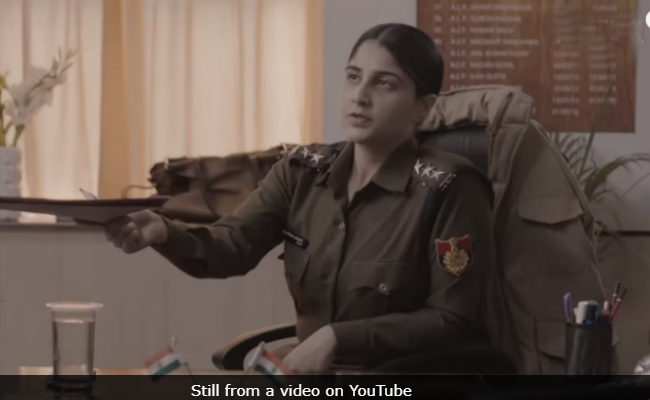 Soni Movie Review: The film shows us the inside of a Delhi police station in a manner that mainstream Hindi cinema rarely does. Two standout performances by Geetika Vidya Ohlyan and Saloni Batra apart, Soni, co-written, directed and edited by Ivan Ayr, has much else that is absolute top-drawer. The film's deliberate pacing and precise mise en scene ensure an unhurried and illuminating examination of the challenges before the cops around whom the story revolves: as they work to make the city safer for women, they must contend with gender expectations while performing their high-pressure official duties. Soni shows us the inside of a Delhi police station in a manner that mainstream Hindi cinema rarely does and draws the audience gradually into a world where the two protagonists have to fight many battles, private and public, to hold their ground without abandoning their principles. Their dilemmas are expressed mostly in quiet, unobtrusive but palpable ways except when the hot-headed eponymous character flies off the handle ad gives physical vent to her coiled-up and entirely justifiable anger. The personal merges with the professional for both Sub Inspector Soni (Ohlyan) and IPS officer Kalpana (Batra). Soni has to contend with an estranged partner, Naveen (Vikas Shukla), who keeps surfacing at her modest home without warning with entreaties for a second chance. Kalpana, whose husband, Sandeep (Mohit Chauhan), is also a police officer, is badgered by her mom-in-law for working too hard and not devoting enough time and thought to planning a family. The two girls soldier on nonetheless. The film opens on a deserted Delhi street on which a woman on a bicycle is pursued by a catcalling stalker. The sequence ends with the lady pushing the man to the ground and pulverising him, leaving him, as we are informed later, with a broken jaw and a swollen eye. The short-tempered woman is a Delhi Police SI who refuses to take any provocation lying down. Her superintending officer, Kalpana, is the exact opposite of Soni. Though only four years into her job, she is always in total control of her nerves. Nothing fazes her but she can do little to save Soni from being transferred to the police control room when the latter slaps an inebriated Navy officer who misbehaves with her at a checkpoint. Kalpana needs Soni by her side because the two are part of a special decoy operation to keep Delhi's streets safe for women. She gets her way. She appeals to her husband to have a chat with the police commissioner and see if Soni can be reinstated. But given the way Soni is hardwired, she simply cannot stand back and follow protocol when she sees men with a sense of entitlement flouting the law. Soni and Kalpana come from divergent backgrounds - a fact that is established as much by their respective homes as anything else - the former lives in a cramped DDA-style police colony flat where she has to do her own household chores; the latter resides in a spacious, airy apartment and has a maid at her beck and call round the clock. But is Kalpana's life all that different from Soni's? Although the issues that the two women grapple with, it apparently isn't. A deep friendship develops between them as the pressures on the duo increases both at home and in the force. The screenplay (written by Ivan Ayr and Kislay) is infused with subtlety and empathy. These two attributes lend the film much of its power. The dangers that the two women face in the line of duty are palpable and they are aggravated considerably by Soni's propensity to plunge head-first into trouble. Kalpana repeatedly counsels caution, but Soni's approach to her job is all heart. She should use her head more, Kalpana's husband quips. He also feels that his wife is too soft-hearted to be an IPS officer. The screenplay underscores, again without making it too obvious, that the sense of humanity that Soni (in her own direct, uncomplicated way) and Kalpana (in a manner that is marked by warmth and commitment) bring to their jobs is at odds with the rough-and-ready approach that the rest of the police force tends to take recourse to in pressure situations. Of course, contradictions are inevitable in this complex, ongoing negotiation that Soni and Kalpana are engaged in with an insensitive society. The latter has no hesitation in advising a flustered 13-year-old niece to confront the boy who taped a sanitary pad to her desk, she argues that Soni should learn to exercise caution when dealing with law-breakers. Director of photography David Bolen captures the distinct textures and physical dimensions of the four principal spaces in which Soni and Kalpana (Batra) live and work: their respective homes, the streets of Delhi and the police station. Together, they evoke the diversity of a storied city that has in recent years received awfully bad press for its worsening air quality and its rising cases of violence against women. By locating his minimalist tale in this sprawling metropolis in desperate need of a clean-up in more ways than one, Ivan Ayr captures a culture, a society and an era, warts and all, seen through the eyes of two female members of the city police force. The cast is spot-on and the measured performances that the director extracts from the actors, especially Ohlyan and Batra, givesSoniits raw, concrete and tactile quality. The slow-burning drama grabs you from scene one and does not release its grip for a minute. Unmissable.